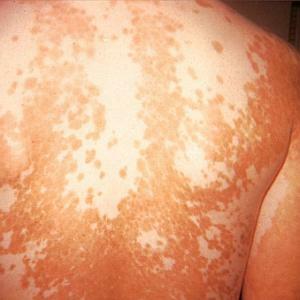 Leucoderma – the buzz word for the skin disease where white patches are seen! No doubt this has a significant impact on the look and appearance ethics that one has but from a dermatologist point of view, it is simply the non-pigmentation of some parts of the skin. And can re-pigmentation happen? Well yes and that too very easily! Yes as unbelievable it may sound treatments are possible to cure the white patch disease. Ayurvedic solutions are developed to take care of this disease in a natural way. There are two kinds of herbal drugs which can be used for the cure of leucoderma- First is photosensitizing drugs which include Psoralea corylifolia (Bavichi), Semicarpus Anacardium (Marking Nut) and Ficus hispida (Kakodumbar). The only precaution which needs to be taken is to restrict exposure to sun 3 hours after the treatment. The second kind of drug is the blood purifiers which is primarily composed of Haridra (Curcuma longa); Bhrigaraj(Eclipta alba); Tinospora (Tinosporacardifolia); sariva (hemidascus indicus); khadir (acasia catachu);apamarga( acaranthus aspara). both the herbs are natural and have no side effects. both these treatments are also referred to as kastha ausadhi. so if you want a pure and natural treatment kastha ausadhi is the best solution. there is also another drug called the ras ausadhi or the herbo mineral drugs which is used for the treatment of leucoderma. This basically includes ras manikya, taal sindur, sameer pannag ras, and talkeshwar ras. Apart from this herbal ingredients like tamra bhasma, kashish bhasm subhra bhasm are also used to initiate regimentation are also used for re-pigmentation. So now you know that there are many herbal drugs which can be used without any risk to get the perfect flawless skin that one desires. These herbs work by circulating blood in the areas where pigmentation has stopped and generates a system where the pigmentation can be resumed without any difficulty. Yes the basics needs to be followed regardless of the treatments. Face has to be cleaned daily and exposure to sun immediately after applies drugs needs to be avoided. Drinking lots of water is also a way to keep your skin healthy. So one thing for sure; leucoderma is a curable disease unlike the common myth. The likelihood of adopting a solution to cure a disease increases manifold if one starts accepting the disease and taking measures to help the drugs help you in the best possible way. You can also refer http://www.ayurveddoctor.com/ayurvedic-treatment-for-leucoderma.html for more information. I HAVE LEUCODERMA FROM LONG TIME. WHICH AYURVEDIC HOME REMEDIES TO CURE LEUCODERMA? I am suffering from white patches since last 10years. Kindly advice if there is any ayurveda treatment for it. Currently taking homeopathic med for the last six years. Initially got recovery, but since last 4 months it is spreading very fast. Kindly suggest.